My apartment is my own little candy shop. My roommates and I have a bowl of cookies on the kitchen table, a platter with M&M’s, starbursts and Hershey Kisses next to the TV and an over sized bowl filled with every kind of lollipop imaginable on the bookshelf. Let’s just say CVS and Shaw’s have made quite a bit of money from us this semester. We have those mini Dum Dum Lollipops, because you can eat three for the same amount of calories as a big Dum Dum (which apparently I thought was amazing when I bought a super sized bag of them). 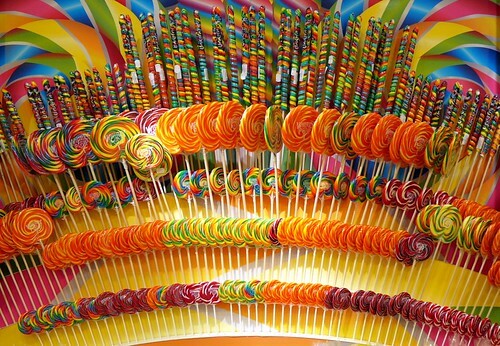 We have Tootsie Roll Pops, and mini Tootsie Roll Pops, and we have those giant round lollipops with crazy flavors like buttered popcorn (gross!). However, my favorite lollipops, and the only lollipops that haven’t lasted longer than a week in the bowl, are People Pops. When I first tried them I was pretty skeptical, because as you’ve noticed I don’t do health food, but you would never know that these lollipops have no sugar, saccharin, nutra sweet, artificial coloring, salt, fat, cholesterol, added caffeine, preservatives, MSG, or trans fatty acids. They’re good and good for you! If you’re that person looking for a buttered popcorn flavored lollipop, People Pops aren’t for you, but they do have a variety of great flavors: Frosty Chocolate Mint, Double Chocolate, Hot & Spicy Cinnamon, Orange Zip, Red Ripe Raspberry, Very Very Cherry, Lime Ricky, Pineapple, Tangy Citrus Parfait, Pink Grapefruit, Lickin Lemon, and Banana. My favorites are Hot & Spicy Cinnamon and Pink Grapefruit. These lollipops are addicting and you won’t be able to stop at just one!